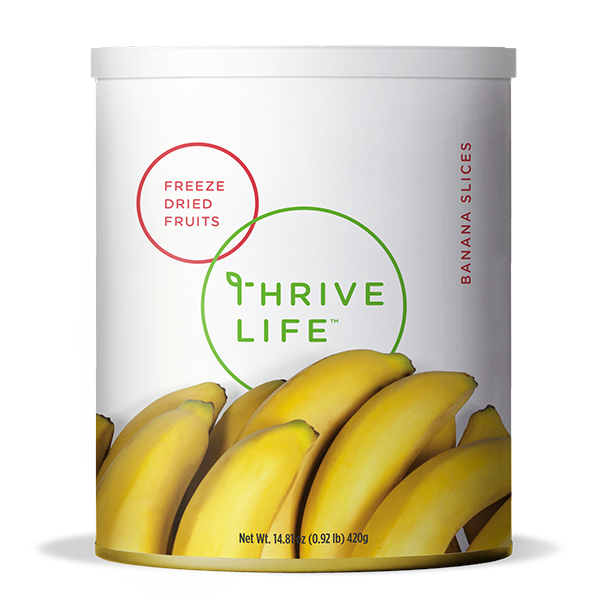 THRIVE® Banana Slices are a freeze-dried specialty that adds mouth-watering flavor to healthy snacks, breakfast, and dessert. THRIVE® Banana Slices are an excellent source of potassium, and they retain all the natural flavors and nutrients of bananas picked right off the tree. You can use THRIVE Banana Slices when they are dry or rehydrated. Simply toss a handful of THRIVE Banana Slices into your fruit smoothies or baked goods for a burst of sweetly tropical flavor. Bananas, citric acid to promote color retention. Add 1⁄2 cup Banana Slices to 1 cup cool water and let sit 10–15 minutes or until tender. For perfect banana breads and muffins, puree them into powder and add them along with the dry ingredients. Just add some extra water to the wet ingredients for rehydration.